Like strokes from an artist’s brush, the sky over Lake Superior and Lake Michigan was painted with long rows of white clouds on February 5, 2007. 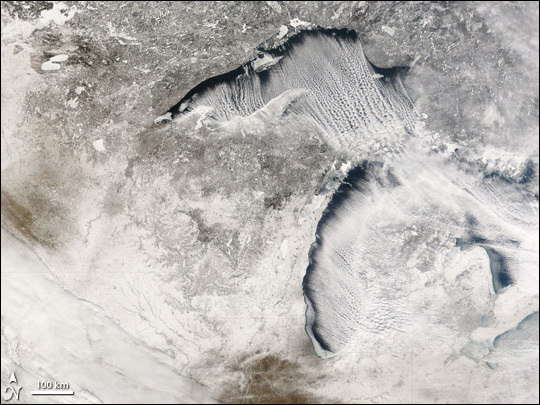 Called cloud streets, these clouds occur when frigid, dry air blows across the lake, where it picks up water vapor from the warmer lake. The water vapor freezes into ice crystals, and clouds form. The clouds take the shape of the wind as it gusts over the water. The same process can also cause lake effect snow or rain when the cold, moist air blows ashore on the lee side of the lake. Signs of lake effect snow can be seen along the southern shore of Lake Superior, which is bright white with little sign of brown vegetation poking through. Students in Peru, New York, brought this photo-like image to the attention of the Earth Observatory. The students were comparing their observations of clouds with satellite observations through a NASA-funded project called S'COOL. The students’ observations provide NASA with land-based measurements of clouds from around the world that are compared with satellite data to improve the quality of satellite observations. The students’ measurements are primarily used to help scientists understand data from the Clouds and the Earth's Radiant Energy System (CERES), which flies on three satellites: Terra, Aqua, and TRMM. 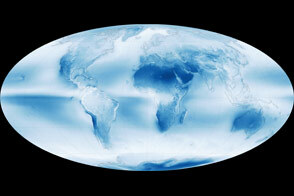 Scientists use CERES data to study the ways in which clouds affect the Earth’s climate. The students also compare their observations to photo-like images collected by the Moderate Resolution Imaging Spectroradiometer (MODIS) on NASA’s Terra and Aqua satellites. 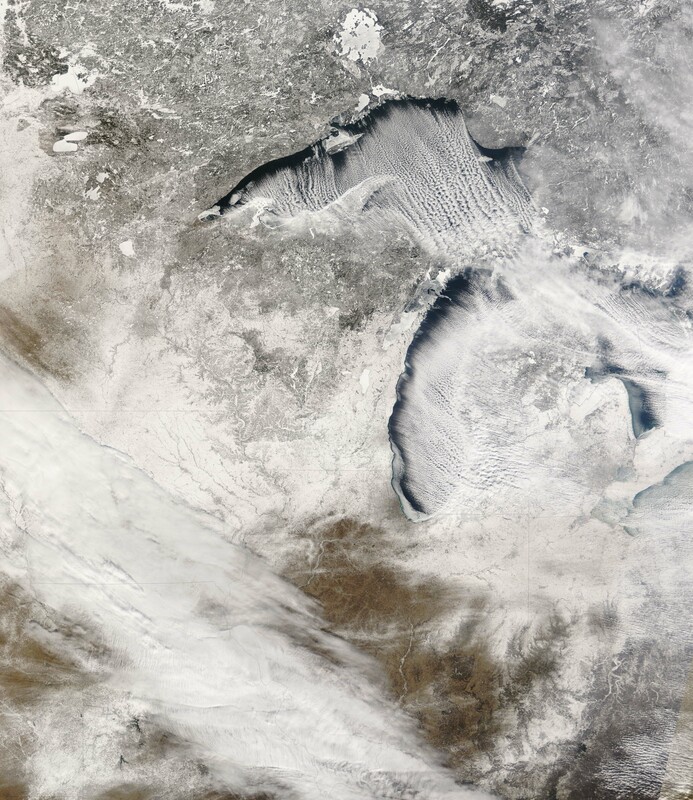 MODIS captured this image on February 5, 2007, from the Terra satellite. 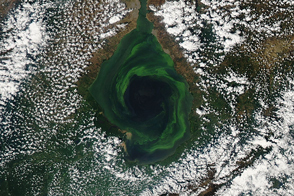 Similar photo-like images are published daily on the MODIS Rapid Response web site. 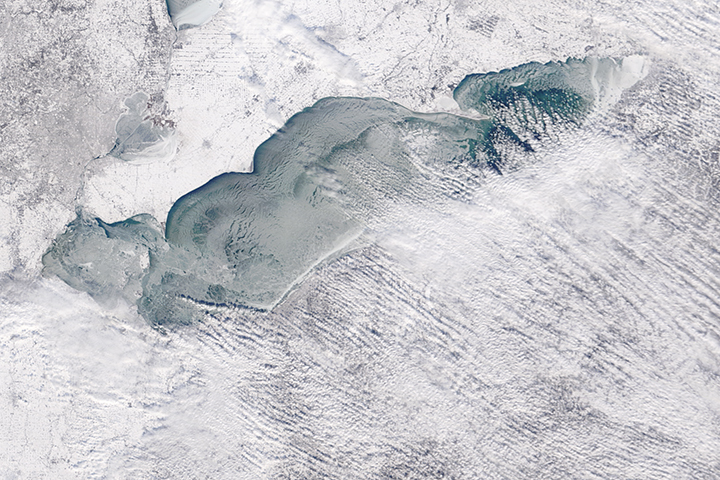 Like strokes from an artist's brush, the sky over Lake Superior and Lake Michigan was painted with long rows of white clouds on February 5, 2007.